The one sided semifinals at the Australian Open 2019 ensured that Nadal and Djokovic will be at loggerheads again tomorrow, Sunday 27th. The two have faced off 52 times with Djokovic barely ahead with 27-25. At Grand Slams though, Nadal enjoys a 9-5 lead over his rival. A head-to-head of 4-3 in Nadal’s favour in Grand Slam finals pretty much assures of another cracker in the ranks. Nadal faced off Tsitsipas in the semifinals and swat him aside in straight sets 6-2,6-4,6-0. Tsitsipas could not pose any significant challenge to Nadal and looked visibly shaken after the match. Djokovic went up against Lucas Pouille and also won easily with the scoreline 6-0,6-2,6-2. Djokovic admitted in the post-match conference that he considers Nadal as his biggest rival. He also confessed that he was looking to concede less games compared to Nadal’s game against Tsitsipas, which he did. With Djokovic and Nadal seeded 1 and 2 respectively, the finale lineup is not at all surprising. The only major omission from the semifinal lineup was Roger Federer who was knocked out in the QF by the 20-year-old Greek, Stefanos Tsitsipas. Both Nadal and Djokovic barely broke a sweat in their road to the finals, even dismissing the first-time semifinalists in their respective matches. Nadal started the tournament as a clear favourite. This was to be his first tournament after last year’s US Open where he had to retire in the semifinal against del Potro due to an injury. Nadal defeated James Duckworth, Matthew Ebden, Alex de Minaur, Tomas Berdych and Frances Tiafoe enroute to his 29th Grand Slam semifinal. Nadal then went on to rout a confident Tsitsipas, who was coming off of the biggest win of his career, in straight sets 6-2,6-4,6-0. “He gives you no rhythm. He has this talent of making you play bad” a devastated Tsitsipas mentioned about Rafa after the match. This is Nadal’s 24th Grand Slam final, and 5th at the Australian Open. Surprisingly, Nadal has won only on one occasion, way back in 2009. He has lost 3 previous Australian Open finals… to Djokovic. Thanks to his comprehensive victories in this years’ Australian Open, this marks Nadal’s 7th Grand Slam final appearance without dropping a single set. He has won 3 of those (French Open 2008, 2010, 2017). Djokovic had a phenomenal season of tennis in 2018, which saw him win 2 Grand Slams to tie with Pete Sampras’ tally of 14 Grand Slams. He started the tournament as the top seed and favourite to win his 15th Grand Slam and 7th Australian Open. Enroute to the finals, Djokovic defeated Mitchell Krueger, Jo-Wilfred Tsonga, Denis Shapovalov, Medvedev, Nishikori and Lucas Pouille in the semis. The top 3 of tennis, Federer, Nadal and Djokovic have asserted their dominance in tennis over the last 15 years. The three share a total of 50 of the 60 Grand Slams in that period. It’s difficult to find a parallel to such an incredible superiority in any other sport over a period of a decade and a half. 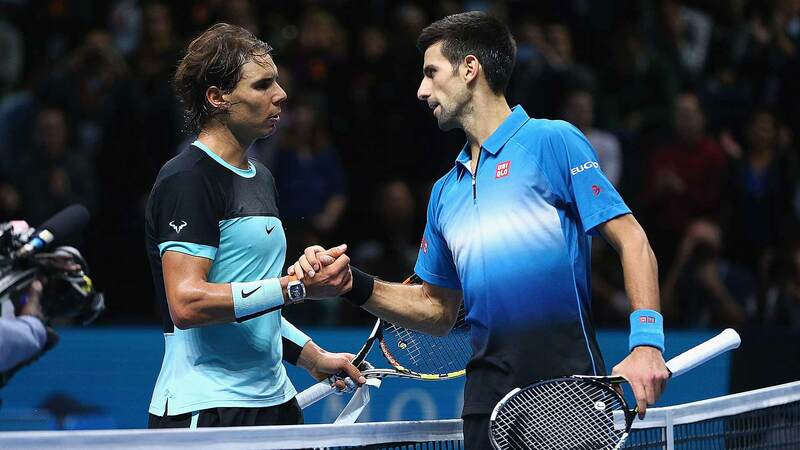 Djokovic and Nadal enjoy one of the most prolific and fierce rivalry in the Open Era of tennis. The two have faced off 52 times, the most in the Open Era. Djokovic barely clings on to the lead with a 27-25 win-loss record against Nadal. In Grand Slams, Nadal has a 9-5 lead including a 4-3 lead in the finals. Nadal has defeated Djokovic in 3 Roland Garros finals and once in the US Open. This year’s Australian Open Final will be their first meeting in Grand Slams since Wimbledon 2018 semifinals. The Serb got the better of Nadal, winning 6-4,3-6,7-6(11-9),3-6,10-8, in a match that lasted for over 5 hours. It’s widely accepted fact that Nadal is practically unbeatable on clay and even more so at the French Open. The two have met 23 times on clay and Nadal has won 16 of those encounters. Djokovic’s only Grand Slam win on clay against Nadal came in the 2015 French Open QF where he ended Nadal’s 39-match winning streak. Their last Australian Open meeting was no less than a magical. They played for the championship in the 2012 Australian Open. It is widely regarded as the greatest match ever played by tennis pundits and former champions. The match lasted for 5 hours 53 minutes and became the longest Grand Slam singles final. It was a test of physical prowess as much as of tennis skills. Almost all the sets went down to the wire. Djokovic won the final in the end with 5-7, 6-4, 6-2, 6-7(5-7), 7-5. If their rivalry so far is any indication, it is safe to say that the AO 2019 Final will be one for the ages. With the 5th set tie-break coming into effect from this year, it may not be a match for their 2012 classic, but it sure will attract tennis fans from around the globe. Novak Djokovic will be looking to add a 7th Australian Open to his trophy cabinet and go past Pete Sampras’ 14 Grand Slams. Nadal will be trying to win his 2nd Australian Open after 10 years and turn the tables after losing 3 previous AO finals to his nemesis. Wimbledon 2018 – Who Will Challenge Federer and Nadal This Year?